Msgr. Charles J. Monaghan, 100, Philadelphia’s oldest priest and pastor emeritus of St. Joseph Parish in Collingdale, died Dec. 9. Born in Philadelphia on March 31, 1915, the son of the late Charles J. and Mary (Doherty) Monaghan, he was raised by an aunt following the death of his parents while he was a small child. He attended Ascension of Our Lord School, St. Hugh of Cluny School and Northeast Catholic High School for Boys before entering St. Charles Borromeo Seminary. Actually, when he initially applied to the seminary, he was turned down due to concerns about his health. He was accepted the following year, and his subsequent longevity proved those concerns were entirely misplaced. He was ordained June 7, 1941 by Cardinal Dennis Dougherty at the Cathedral of SS. Peter and Paul, and his first assignment was as chaplain at Our Mother of Mercy Chapel in Philadelphia. He also served on the faculty of St. James High School in Chester, and as vice rector and then rector at Villa St. Joseph in Darby from 1954 to 1970. Msgr. 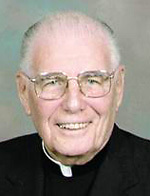 Monaghan was appointed pastor of St. Hugh of Cluny Parish in 1970 and pastor of St. Joseph Parish in 1980, where he served until being named pastor emeritus in 1990. In recent years, he was a resident of St. Francis Country House, now called St. Francis Center for Rehabilitation and Healthcare. Veronica Cucinnota, whose late husband worked closely on finances with Msgr. Monaghan, recalls his reputation for generosity. If he visited someone he knew had financial difficulties, oftentimes after he left they would find unexplained money on a table or somewhere in the house. “He was very generous with people who were down on their luck,” Cucinnota said. She also recalls him telling the story about when he was only three, his mother would often take him to church, and he loved the ringing of the bells and wished he could be a priest too. Father Thomas Sodano, current pastor at St. Joseph’s, would visit Msgr. Monaghan at St. Francis Center frequently and remembers how alert he was up to the very end. Toward the end when Msgr. Monaghan was in hospice, Father Sodano would visit every other day. “I would say evening prayer with him, and at the end a very loud ‘Amen’ would come from his bed even though he was on oxygen,” Father Sodano said. Msgr. Monaghan’s funeral Mass will be celebrated at the St. Francis Center for Rehabilitation and Healthcare chapel at 11 a.m. on Monday, Dec. 14, preceded by a viewing. Auxiliary Bishop Timothy C. Senior will be the principal celebrant; concelebrants will include Msgr. Dombrow and Msgr. Daniel Sullivan, and Father Sodano will be the homilist. Msgr. Monaghan is survived by cousins. Interment will be at Holy Cross Cemetery in Yeadon.